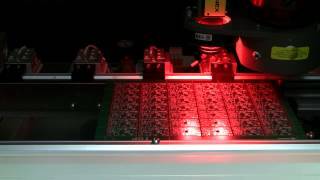 PCB depaneling (singulation) laser machines and systems have been gaining popularity over recent years. Mechanical depaneling/singulation is done with routing, die cutting, and dicing saw methods. However, as the boards get smaller, thinner, flexible, and more sophisticated, those methods produce even more exaggerated mechanical stress to the parts. Large boards with heavy substrates absorb these stresses better, while these methods used on ever-shrinking and complex boards can result in breakage. This brings lower throughput, along with the added costs of tooling and waste removal associated with mechanical methods. 2. What is the thickness of your boards? Min and Max. 3. If populated boards, what is the height of the tallest component? 4. What process are you using currently to cut boards? 5. Are there metal leads in the cut area? 6. Do you have cycle time requirements to meet, match, or exceed? 7. How concerned are you about charring at the laser cut area? 8. Tabs or full perimeter cuts? 9. Minimum distance from cut edge to board? 10. 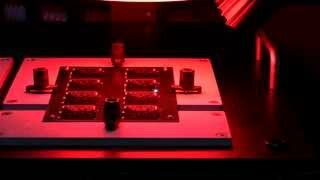 How will the boards be presented to the laser system? Manually, conveyor, pallets, fixtures? 11. Two techniques of cutting are complete through cut or a perforated cut. Any preference? 12. After singulating, how will the boards be handled? 13. Will the laser system need to be CE certified? 14. Can you supply prints of your boards? 15. Can you supply samples of your boards? Lasers, on the other hand, are gaining control of the PCB depaneling/singulation market due to higher precision, lower stress on the parts, and higher throughput. Laser depaneling can be applied to a variety of applications with a simple change in settings. There is no bit or blade sharpening, lead time reordering dies and parts, or cracked/broken edges due to torque on the substrate. 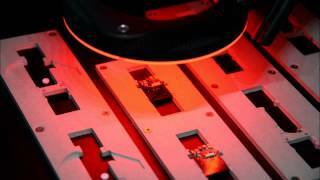 Application of lasers in PCB depaneling is dynamic and a non-contact process. No tooling cost or consumables. Optical Recognition before PCB depaneling/singulation process begins. CMS Laser is one of the few companies to provide this feature. Extraordinary cut quality holding tolerances as small as < 50 microns. 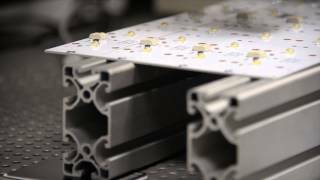 CMS Laser is working with several PCB manufacturers as aluminum PCB depaneling becomes more widely adapted. Aluminum PCB is growing in popularity for applications where heat buildup and dissipation are concerns. If aluminum depaneling is a current or future endeavor, talk to our Apps Lab about our successes in this arena. Laser PCB depaneling allows for exact cuts at extremely tight tolerances with no contact to the board itself, allowing for fragile circuits to remain unharmed by torque, twisting, breaking, and snapping.